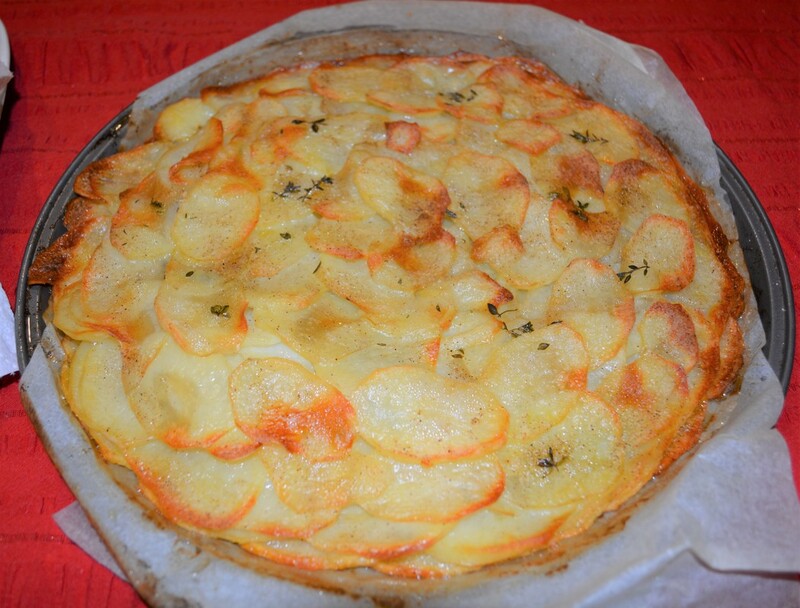 Pommes Anna is one of my families favourite ways to eat potatoes. I put it straight from the oven onto the table and we just pick at it piece by piece until it is all gone. The top and sides are crispy, whilst the centre is soft and creamy. Just beautiful. After a little initial preparation, you place it in the oven, it takes 2 hours to bake, so you are free to prepare the rest of dinner. Ideally use a mandolin to slice your potatoes, as the slices will be even and very thin, which makes for nice layering, but last night I was a little rushed so I sliced it with a knife (quickly) and the slices were not quite perfect, but no one cared, actually, no one noticed. The herbs can be any ones you like. Last night I used dried thyme as I forgot to buy fresh herbs. Season each layer with salt and pepper, it needs it. I use a pizza pan but you could use a casserole dish. Also the recipe states after 1 1/2 hours of baking you should turn it out onto a ovenproof platter, I would do this for a dinner party maybe, but for my family alone, I don't bother, I just uncover and put it back the way it is, and serve on the baking dish, less hassle, less washing up. If you do want to flip it, the butter is what sticks the potatoes together, and you need to dry the potatoes with a paper towel to remove excess moisture to help the potatoes stick. This can be served with steak, fish or even a stew, anything really. Preheat oven to 190C. Brush a shallow 1 litre ovenproof dish with a little of the melted butter, or line a pizza tray with baking paper. Slice the potatoes thinly. 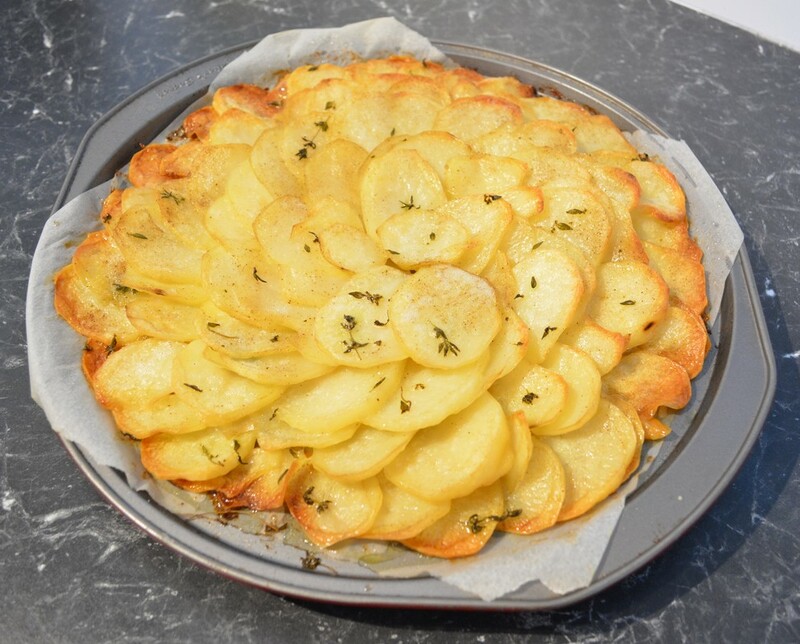 Arrange a layer of potato slices in the prepared dish until the base is covered. If using a pizza tray, I start from the outside and make a large circle, each slice slightly overlapping, then move inwards making circles until the circle is full. Brush with a little butter, sprinkle with a quarter of your herbs, season with salt and pepper. 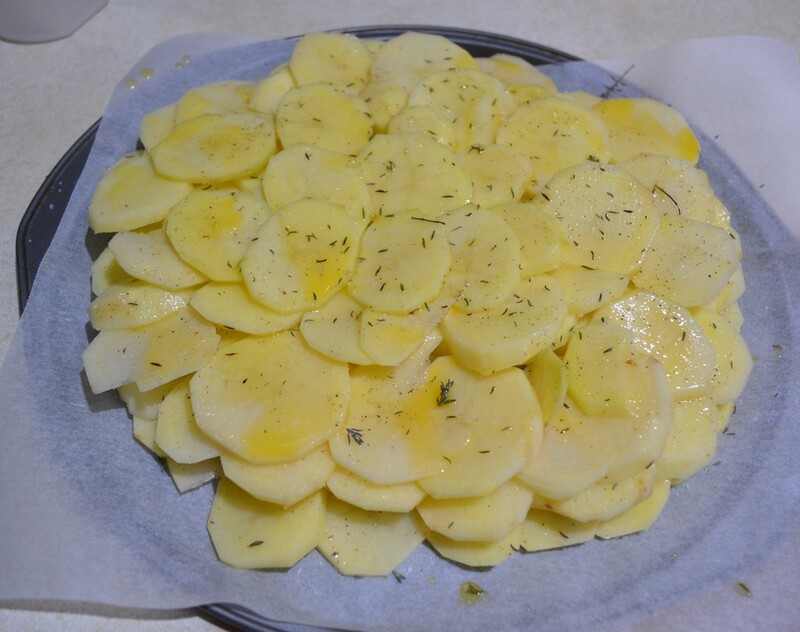 Continue layering the potato slices, brushing each layer with butter and sprinkling with herbs, seasoning with salt and pepper, until all the potato slices are used up. Brush the top layer with butter and season with salt and pepper. Place a sheet of baking paper on top, this prevents the potatoes from sticking to the aluminium foil. Cover completely with aluminium foil. Place in your preheated oven for 1 1/2 hours. Turn out on to a warm ovenproof platter and return to the oven for a further 25-30 minutes or until golden brown. I tend not to do this if it is just for my family, I just uncover and place it back in the oven as is. Serve immediately, garnished with herbs.